Streaked horned lark. Photo by Rod Gilbert. The streaked horned lark is a rare endemic subspecies found only in western Washington and Oregon. It is perhaps the most distinct subspecies of the horned lark, a small common ground- dwelling passerine that prefers open grassland habitat (Beason 1995, Rogers 2000, Stinson 2005). In Washington, the streaked horned lark nests on grasslands and sparsely vegetated areas at airports, sandy islands and coastal spits; Oregon nesting areas include fallow agricultural fields in the Willamette Valley. The streaked horned lark was once abundant on Puget Sound prairies, but has become increasingly rare with the decline in habitat and is now restricted to a few large open grassland sites in Washington. Genetic data indicate that the subspecies is unique, isolated, and has little genetic diversity (Drovetski et al. 2005). Historically, streaked horned larks bred from southern British Columbia, through the Puget Trough in Washington and in the Willamette and Rogue River Valleys in Oregon (Rogers 2000, Stinson 2005) (Figure 2). The breeding range of the lark has contracted over time with extirpation from former breeding sites in northern Puget trough, southern British Columbia, the Washington Coast north of Grays Harbor, and the Rogue River Valley of Oregon (Rogers 2000, Beauchesne and Cooper 2003, Stinson 2005). More than 90% of the original grasslands have been lost in the south Puget Sound region as a result of development, and the incursion of trees, shrubs, and non-native invasive species, such as Scotch broom (Cytisus scoparius) (Chappell et al. 2001, Foster and Shaff 2003). In addition to state and federal listing status in the U.S., the streaked horned lark is listed as endangered under the Species at Risk Act in Canada (Beauchesne and Cooper 2003). Population estimates indicate that there are probably fewer than 1,000 streaked horned larks remaining, with about 330 birds breeding in Washington and 440 in Oregon (Pearson and Altman 2005). Pearson and Altman (2005) cautioned that these estimates combined data from separate efforts over a time period of 8 years. The streaked horned lark is currently known to breed at 13 locations in Washington: 6 inland sites, 4 coastal sites, and 3 Columbia River sites. Population estimates based on winter surveys produced estimates of about 500-600 in 2004-2005 (Pearson and Altman 2005). U.S. Fish and Wildlife Service Listing proposed rule. In October 2012, the USFWS proposed to list the Streaked Horned lark as Threatened under the Endangered Species Act (USFWS 2012). The proposed rule also would designate critical habitat. Population monitoring. Three new probable breeding sites were discovered in 2012, including 2 along the Columbia River (Kalama and Sand Island Marine Park near St. Helens, Oregon) and on Johns River Island, on the Washington Coast. A standardized monitoring protocol was developed and is in use by WDFW and partners. Most sites were visited 3 times during the breeding season, and the total of high counts totaled 196 in Washington in 2012 (Table 1). Demographic studies. Camfield et al. (2011) monitored 257 streaked horned lark nests on seven sites in Washington and banded 58 adults (26 females, 32 males) and 88 juveniles. They developed a demographic model to estimate population trends and to identify the parameter and life stage that would be the most important targets for management. They reported that streaked horned larks in Washington were declining rapidly and that local breeding sites were not sustainable without immigration. In addition, although there are no data on range-wide population trends for streaked horned larks, territory mapping data from four sites in the Puget lowlands indicated that the number of territories had decreased 45% over 3 years from 77 territories in 2004, to 42 in 2007 (S. F. Pearson, unpubl. data). They concluded that the highest priority for management was to increase adult survival, followed by improvement of juvenile survival and fecundity. Horned Larks are the most commonly reported species involved in collisions with Air Force aircraft, and represent almost 13% of all reported strikes (BASH 2009), but it isn’t known how often streaked horned larks are struck by aircraft. Streaked horned larks nest at five airports in Washington and one in Oregon. If collisions are an important mortality factor, improving nesting habitat away from active runways where suitable habitat is available, may reduce collisions and improve adult survival. Research by Oregon State University has been ongoing for 4-5 years to understand juvenile lark movement, survivorship, and habitat use in the Willamette Valley. Telemetry of large chicks was initiated in 2012. This work will continue in 2013 (R. Moore, pers. comm.). Nest exclosure trials. During 2009-2010, WDFW, and the USFWS-Willapa National Wildlife Refuge tested the efficacy of wire nest exclosures to reduce predation for improving fledging success, without increasing predation on adults. The nest exclosure design used did not improve nest success, because lower rates of predation were offset by nest abandonment (Pearson et al. 2012). Nest abandonment was probably caused by American Kestrels (Falco sparverius) perching on the exclosure and predation of adults at exclosed nests at the Corvallis Airport study site. Modified designs that preclude perching by raptors may be tested in 2013. Genetic augmentation on Joint Base Lewis-McChord. Anderson (2010) reported that streaked horned lark at 13th Division Prairie on Joint Base Lewis-McChord had significantly lower values in all measures of reproductive success when compared to both a guild of ground nesting birds and savannah sparrows (Passerculus sandwichensis). Streaked horned lark’s low egg hatching rate of 44% suggested that inbreeding depression was playing a role in the decline of larks at 13th Division Prairie. A project was initiated in 2011 to address the issue of inbreeding and low hatching rate, by moving eggs from Willamette Valley in Oregon to nests on 13th Division; the plan involves moving eggs from five lark nests in 2011, and again in 2012. The project requires the donor and recipient nests be at the approximate same stage of incubation; it takes advantage of intensive nest monitoring being done during a study in Oregon (Randy Moore, pers. comm.). In 2011, 4 clutches of 3 eggs were moved; 11 of the 12 translocated eggs hatched, and 3 of 4, 3-egg clutches fledged a total of 5 or 7 young. 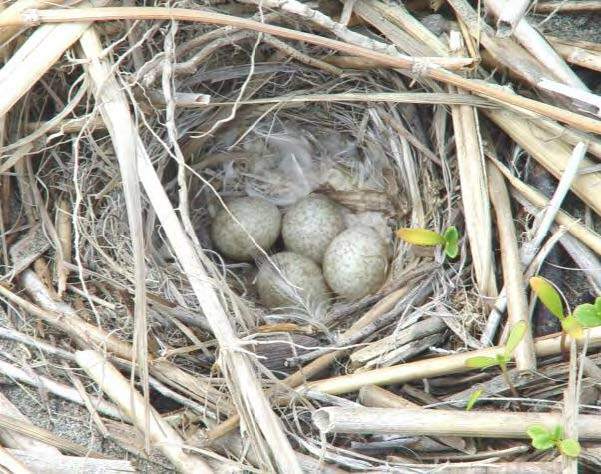 In 2012, no egg-clutches were translocated to Puget Sound nests from Oregon due to significantly high nest failure at the Corvallis airport (floods and then mass predation) and a mismatch of timing of clutch incubation (Wolf 2012). One Oregon translocated nestling returned to 13th Division Prairie as an adult male, but did not breed successfully with a female in 2012. No other banded birds that originated from Corvallis translocated clutches were observed at other lark nesting sites (i.e., McChord Airfield, Gray Army Airfield, JBLM Range 76, Olympia and Shelton airports). This bird returned to 13th Division in 2013, and if it successfully reproduces, it may provide the needed improvement in genetic diversity of the local population to improve fitness and reduced extinction risk. Subsequent monitoring will determine whether the male or other translocated birds return to breed (Wolf 2012). Habitat restoration and management. In 2004-2005, Pearson et al. (2005) tested the effect of controlled burns on larks. Lark abundance was significantly higher on burned plots compared to controls (p = 0.10) in the breeding season following the burn. Burned plots had significantly less thatch, forbs and total vegetation, with more moss/lichen and open groud; there was no differences in the percent cover of annual or perennial grasses (Pearson et al. 2005). 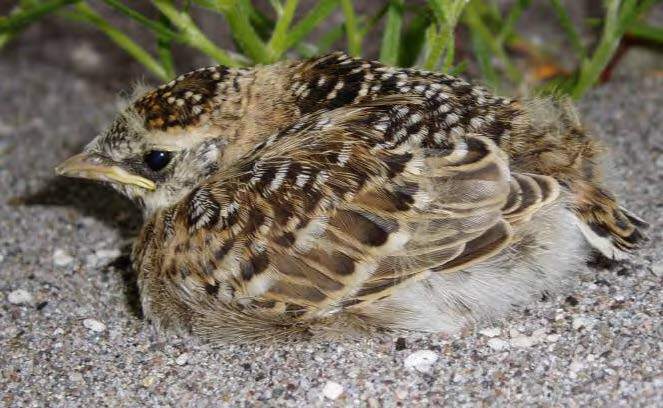 The Center for Natural Land Management and U.S. Army Corps of Engineers conducted management experiments during 2009-2011 on dredged material islands in the lower Columbia River to test methods of maintaining sparse vegetation for streaked horned lark nesting habitat. A tractor was used to till treatment plots to create the open habitat condition used by larks; plots were tilled with 1 pass, 2 passes, or with alternating tilled and untilled strips. After treatments, larks used all the treated plots and none of the control/untreated plots (Anderson 2011). Willapa NWR removed introduced beachgrass (Ammophila spp.) from a Habitat Restoration Area that has been expanded to 250 ac; originally intended to provide nesting habitat for snowy plover, the area also has provided nesting sites for larks. WDFW and volunteers treated five 1-ac plots at Leadbetter State Park to remove beachgrass to create nesting habitat for plovers during 2007-2009, but to-date these plots have not been used for nesting by either species. Scotch broom control and prairie restoration is an ongoing activity on Joint Base Lewis-McChord, and a large prescribed burn was conducted on 13th Division Prairie in 2012 that may improve and increase nesting area for larks there. A guide for managing agricultural lands to benefit Streaked Horned Larks was completed in 2011, with a grant from the Department of Defense Legacy Program (Moore 2011). Conspecific attraction study. In 2012, a two-year research study was initiated to examine the feasibility of attracting Streaked Horned-larks to nearby sites through the use of using recordings of their calls and three-dimensional Streaked Horned-lark decoys. Study sites are at Joint Base Lewis-McChord and the St. John’s Landfill in Portland, Oregon. The study is being done by Center for Natural Lands Management and Evergreen State College. Working Group. A range-wide interagency streaked horned lark working group meets at least annually to identify and prioritize conservation actions for the streaked horned lark. In March 2011, The Nature Conservancy, with support from USFWS and a Department of Defense Legacy grant, hosted the Streaked Horned Lark and Pacific Northwest Airports: A Collaborative Workshop that brought together interested parties to explore opportunities for conserving the streaked horned lark without impacting aircraft safety. Partners and cooperators: U.S. Fish and Wildlife Service, Center for Natural Lands Management, Department of Defense, Joint Base Lewis-McChord, Oregon Dept Fish and Wildlife, Oregon State University, Willapa National Wildlife Refuge, and Washington State Parks. Anderson, J. K. 2010. Comparing endangered streaked horned lark (Eremophila alpestris strigata) fecundity to other grassland birds. M.S. Thesis, Evergreen State College, Olympia, Washington. Anderson, H. 2011. 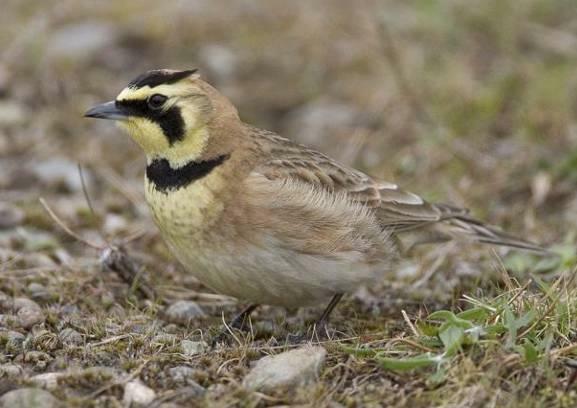 Columbia River Streaked Horned Lark Restoration Trial: final report to the U.S. Fish and Wildlife Service. Cooperative Agreement#13410-9-G007. Center for Natural Lands Management, Olympia, Washington. 25 pp. Beason, R.C. 1995. Horned lark (Eremophila alpestris). Birds of North America No. 195. (A. Poole and F. Gill, eds.). The Academy of Natural Sciences, Philadelphia, and The American Ornithologists’ Union, Washington, D.C., 24 pp. Chappell, C. B., M. S. Mohn Gee, B. Stephens, R. Crawford, and S. Farone. 2001. Distribution and decline of native grassland and oak woodlands in the Puget Lowland and Willamette Valley Ecoregions, Washington. Pp. 124– 139 in S. H. Reichard, P.W. Dunwiddie, J.G. Gamon, A. R. Kruckberg, and D. L. Salstrom (eds.). Conservation of Washington’s Rare Plants and Ecosystems. Washington Native Plant Society, Seattle. Drovetski, S.V., S. F. Pearson, and S. Rohwer. 2005. Implications of mitochondrial DNA diversity on the conservation status of the streaked horned lark Eremophila alpestris strigata. Conservation Genetics 6:875- 883. Foster, J. R., and S.E. Shaff. 2003. Forest colonization of Puget lowland grasslands at Fort Lewis, Washington. Northwest Science 77:283-296. Moore, R. 2011. Managing agricultural land to benefit streaked horned lark: a guide for landowners and land managers. Oregon State University and Center for Natural lands Management. 23 pp. Pearson, S. 2010. Genetic Enhancement of Puget Lowland Streaked Horned Lark Populations. Unpublished proposal, Washington Department of Fish and Wildlife, Olympia, Washington. Pearson, S. F., and B. Altman. 2005. Rangewide Streaked Horned Lark (Eremophila alpestris strigata) Assessment and Preliminary Conservation Strategy. Washington Department of Fish and Wildlife, Olympia, Washington. 25 pp. Pearson, S. F. , H. Anderson, anfd M. Hopey. 2005. Streaked horned lark monitoring, habitat manipulations and a conspecific attraction experiment. Washington Department of Fish and Wildlife, Wildlife Science Division, Olympia, Washington. 38 pp. Pearson, S. F., R. Moore, and S. M. Knapp. 2012. Nest exclosures do not improve streaked horned lark nest success. Journal of Field Ornithology 83(3):315-322. Pearson, S.F., C. Sundstrom, W. Ritchie, and K. Gunther. 2010. Washington State Snowy Plover Population Monitoring, Research, and Management: 2010 Nesting Season Research Progress Report. Washington Department of Fish and Wildlife, Olympia, Washington. Rogers, R. E., Jr. 2000. The Status and Habitat Selection of Streaked Horned Larks, Western Bluebird, Oregon Vesper Sparrow, and Western Meadowlark in Western Washington. M.S. Thesis, Evergreen State College, Olympia, WA. 185 pp. Stinson, D. W. 2005. Washington State status report for the Mazama pocket gopher, streaked horned lark, and Taylor’s checkerspot. Washington Department of Fish and Wildlife, Olympia, Washington. 129 pp. Wolf, A. 2012. South Puget Sound Streaked Horned Lark (Eremophila alpestris strigata) Genetic Rescue Study: report for Year 2. Center for Natural Lands Management, Olympia, Washington. 18 pp.